Subway Surf having a Google Play record of over 20 million download and installation, is a very fun and engaging arcade dash game that feature some fantasy cartoon character such as Jake, Tricky, Fresh and others trying to escape from a grumpy Inspector and his dog. Thus the main aim of the game is for it’s players to help these fantasy cartoon characters escape the inspector of the subway by dashing/running as fast and far as you can, dodging oncoming trains and other obstacles. More than just running from the Inspector and his dog, the game also features a leader board where all your Facebook friends who are or have played the game is ranked based on their all-time high score acquired when playing the game. It also has a weekly leader board where all players of the game in a specific country (i.e your country of residence or the country you specify to run in for that week) is ranked on a weekly basic. So apart from escaping from the Inspector and his dog, dashing as far and as long as you can in the game is the most important feature of the game, because the long run in a single session the more you acquire scores, and the higher your score, the more chances you have to being on top of both your Facebook leader (which is all-time high score) and that of your country (which is based on the high scores acquired in a week). 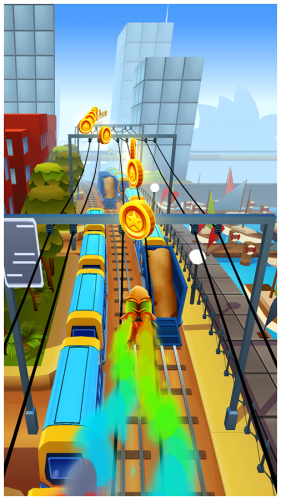 Hence, this article of ours, is aimed at helping you get the highest possible score you can get tips on how to surf the subway for the longest possible time you can and thus be on top of all the leader board since you will have the highest of score. 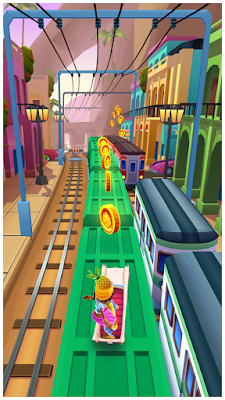 Familiarize Yourself With The Subway: One thing you should know and always have in the back of your mind when playing Subway Surfers is, in all version of Subway Surfers, the subway has one pattern of design. The only difference is the sceneries in the different version. Thus when you have known the subway very well, you will know which part of the subway trains are parked, which section trains are moving and which section of the subway double trains moves instantaneously. Running Though Bridge With Pillars: In the subway, you will notice that there are bridges with pillars, so when you are running through such bridges, we recommend that you do not wait until you see an oncoming train before you switch to the other lane of the bridge. We are not here saying that you should switch without seeing oncoming trains, that will be very unwise, what we are saying is that, it is better to dash in-between the pillars than on the plain lanes, because when you do this, then it requires just only one switch on your part to move to the free lane when there is an oncoming train in the other lane. 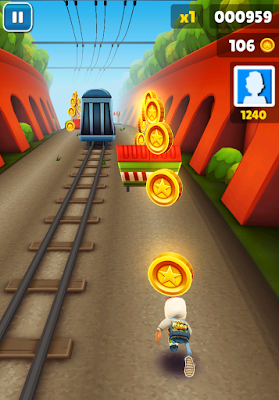 Jetpacks will enable you glide above trains, bridge and other obstacles, and when you are above these, you are no longer in the treat of being hit by an oncoming train, or that your run will be obstructed by an obstacle, so all you need is to focus on collecting coins until you come down from the jetpack. Specking on collecting coin, do you know that each coin you pickup will add about 50 points to your score when your run finally ends? That is the fact, so do not just rely on dashing as far as you gain to gain score points, coin can help you out. Let us do this calculation to help you understand the value of coins to your score. Let us suppose that in your run session, you pick up 2,000 coins, that will be 2,000 multiply by 50, which is about 100,000 score that will be added to your total score you acquire during the run session. So now, do you still think that coins are not all that important to your score? Do you know, the level/stage you are in determines the how your score is calculated, and scores are calculated as per 10 milliseconds you spend running? This means that when you have gotten to level/stage 30 which is the highest of level, your multiplier will now be 30, thus every seconds you spend running, you will be getting 30 x 10 = 300 as score. So instead of just dashing, focus on completing your missions so that you will get to the highest of stage/level where your multiplier will now be 30. 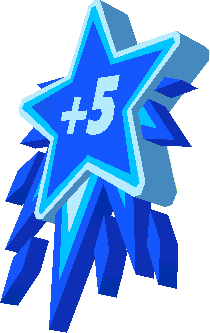 Picking up the X2 Multiplier Power up means that your current stage/level multiplier will be doubled during the duration of the X2 Multiplier Power up. Using our example on tip 5, this implies that each score you spend running will now be 600 score when you have picked up the X2 Multiplier Power up. 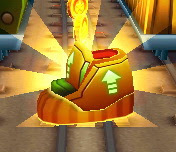 When you have known how to control your jump when you wear s Super Sneakers, it will help you escape in a situation where you unknowing run in a lane where there are parked trains by the side and an oncoming train ahead in the same lane, thereby leaving you a switch lane option, because with the Super Sneaker you can jump over trains. 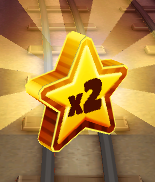 More also, when you wear a Super Sneakers and a Jumper let you land on top of a bridge, the Super Sneakers will attract all the coins that is below the bridge in the lane that you are in including any power up and even Mystery box. So you see, Super Sneakers is not your Enemy. 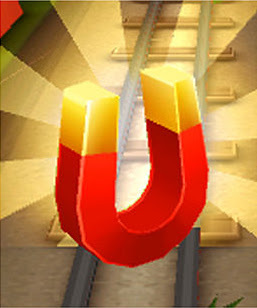 The Magnet power up is indeed your best shot that you need to pick up when you see them while running. Because when you pick up the Magnet power up, it will attract each and every coins that are available while running to you, even if those coins are not in your lane. And with regard to what we talked about the value of Coins to your final score, Magnet and indeed all other Power Ups are your best shot to succeed as a subway surfer. Do you know, each power up you pick up can last up to 30 Seconds? Well that is a fact. This means, more time to attract coins to yourself using Magnet, longer opportunity to stay away from death and the Inspector using Jetpacks, more time for X2 Multiplier to keep doubling your score. Isn’t this just amazing? 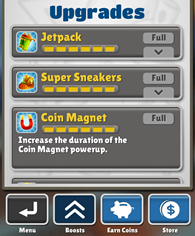 To increase the duration of these Power Ups including Super Sneakers, tap on the Shop button in the home screen of the game, and in the Boosts tab, scroll down to Upgrades. Every Thursdays after you have connected your Subway Surfers to the internet so as to know your Word search for the day, you will also be told to run with a specify cartoon character. If you do, then your multiplier will be increased by 5. This implies that if you are already in the last stage where your multiplier is 30 and your then run with that character you were told to run with, then your multiplier will now be 35, and if you now pick up the X2 Multiplier Power Up while you were running, then your multiplier will now be 70, now multiply this by 10 for every second you run, that will be about 700 point for your score. So you see, Thursdays are good days to play Subway Surfer. Do you remember that earlier, we said that there might be situation where you will not be able to get out of the lane you are in because there is a parked trains by the side(s) and oncoming train in your lane? Well, if you try to stay on top of trains, whether moving or parked, that situation will never happen and more to that, you will have a better view of what lies ahead. So see, Staying on Top of Trains is a sure way to avoid death, and collision that will make you get caught by the inspector, remember, his dog is also chasing you!!! 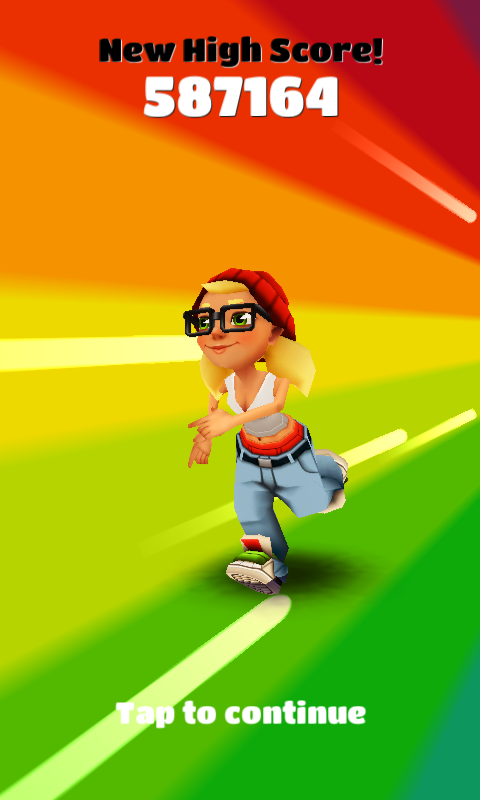 With the successful application of all these tips, we are confident that you will succeed as a subway surfer because you will stay on top of all the leader board groups you are in. If you are a Subway Surfers guru and you know of any other tip we did not include please let us know, and we will sure to include it as soon as possible. Let us help Subway Surfers Novice enjoy this Game! !.